Alberta Johanna Havinga (nee deKoning), born January 23, 1930 went home to be with her Savior and Lord, while surrounded by family on March 7, 2019 at the age of eighty-nine. Born in Iowa, USA at the family home; Alberta moved to Canada where she met and married Arthur Havinga on February 2, 1959. After 60 years of marriage, Alberta is survived by her beloved husband Arthur, and will forever be remembered by her children Adrianna (Dyce) Bolduc, Jennie (Brian) Cherniwchan, Walter (Theresa) Havinga, and Elza Bouwman. She will also be missed by her 15 grandchildren and 7 great grandchildren. She is further survived by her sister’s husband, Ralph Poelman, and her brother and sisters-in-laws and various family members in the United States of America. Alberta was predeceased by her parents Albert and Mary deKoning, sister Wilma Poelman, her son and his wife Sid (Margaret) Havinga, and one grandson, and one great grandson. Also predeceased by in-laws John and Jennie Havinga, Dena Titsing-Havinga, Marie (John) Sterenberg, Bill Titsing and Rocky Robinson. Alberta dedicated her life to her raising her children and helping on the family farm at Granum. She could be found helping out milking the cows, driving tractors, feeding chickens, or gardening throughout their farm life. In the early ‘70s Alberta spent some time working at the Claresholm Care Centre. With time Alberta and Arthur chose to retire to Lethbridge where they stayed active in the Church. Alberta enjoyed being an active member of the church. This included teaching Sunday School; playing the organ and piano for church services; being a member of the Golden Hour and Ladies Aid Society; and custodian for the Granum Christian Reform Church. Alberta’s support of the Ladies Aid society led her to creating many crochet and sewing projects. She continued these hobbies making presents for various family members until her health no-longer permitted her to. Alberta’s many talents and strong faith will be greatly missed. A Funeral Service will be held 10:00am, on Friday, March 15, 2019 at the at the MARANATHA CHRISTIAN REFORMED CHURCH, 260 McGill Blvd. W, Lethbridge, Alberta, with Pastor Paul Van Stralen officiating. 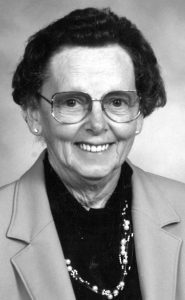 She will be laid to rest at the Granum CRC Cemetery at 2:00 pm. Flowers are gratefully declined. For those who wish, memorial donations may be made to the Alberta Cancer Foundation, Jack Ady Cancer Centre 1A129, 960 – 19th Street South, Lethbridge, AB, T1J 1W5. or the Canadian Diabetes Association, 204, 2323- 32 Avenue N.E, Calgary, AB, T2E 6Z3. Our sincere condolences Jennie/Brian, Walter/Theresa and families on the loss of your beloved mother. Hugs.